Dr Jeffrey B Geske: Greetings. I'm Dr Jeffrey Geske, assistant professor of medicine and cardiologist at Mayo Clinic. During today's trending topics video, we will be discussing reverse-order liver transplantation. That's liver transplant before heart transplant. 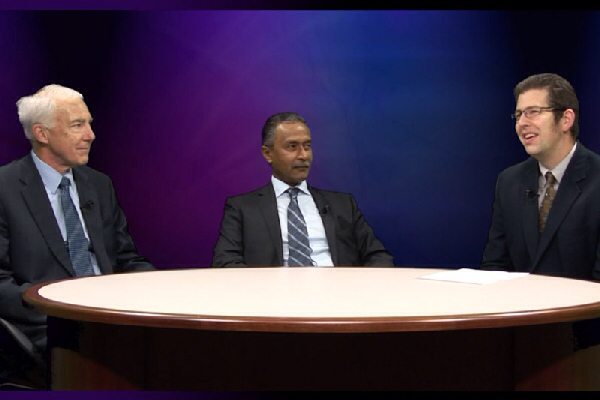 I'm joined by my colleagues, Dr Sudhir Kushwaha, professor of medicine and the director of our Heart Transplant Clinic, as well as Dr [Richard] "Rocky" Daly, professor of surgery and surgical director of the Heart Transplant Clinic. Welcome. Dr Sudhir S Kushwaha: Good to be here. Dr Geske: Recently, you've experienced successful reverse-order liver-heart transplantation. When are some times when you might think about combined organ transplant, either the reverse or the more traditional combination? Dr Kushwaha: Well, as you know, Jeff, there are certain situations where the heart and the liver are both affected, sometimes by a systemic disease process, which requires a combined organ transplant. [1-3] Other times, when the severity of the heart failure is such that the liver ends up getting cirrhosis. We're familiar with that in conditions, particularly, where there's severe right heart failure. Then there are other diseases where there might be a concomitant liver process going on, and we're considering heart transplant because the patient has heart failure as well.